this laurel wreath collection dress makes me rather darn happy! 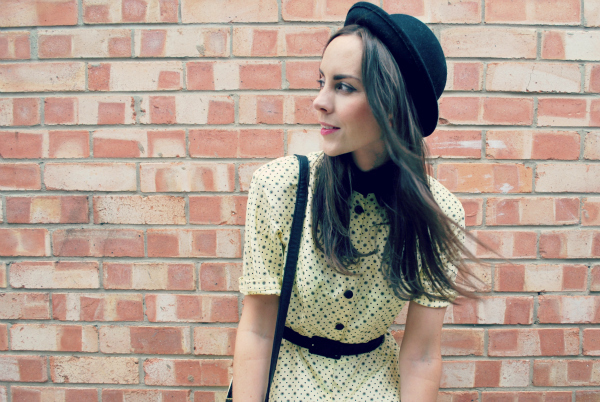 essentials aside it's such a cute 1950's inspired number! covered with daisies and polka dots, crafted from silk, it's light as a feather and perfect for evenings in this heatwave. I can't believe how hot it's been this week, crikey! one of my favourite features is the high rounded black collar which you can't see much of in these pictures as my tangled mane has rather taken over. the boots are best friends to my feet, uber comfortable (I can walk properly in them) thank the lord for new look. 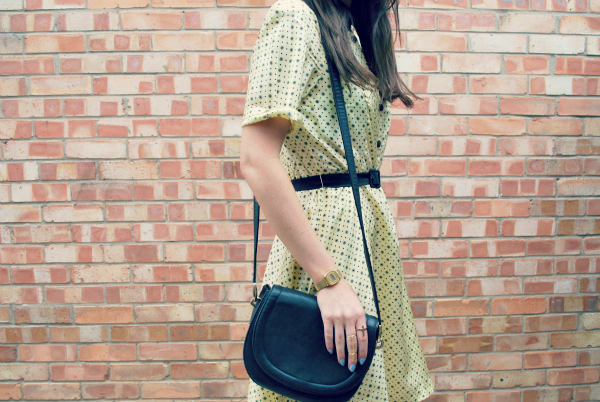 my bag was acquired from the result of rummaging through some of my favourite vintage and second hand shops and is one of my go-to daytime accessories... I can cram an unholy amount of clutter and make up into it...winner! hope you're all enjoying the sunshine, I seem to have an ice lolly surgically attached to my hand at all times, for medicinal purposes obviously..
ps, a big thank you to inside fruits who gave my blog the most lovely write up in their 'I love your style' feature here last week.. it actually made my day! you can also email them to nominate any blogs you love reading and help spread some blog love! I love your dress and the whole outfit. I love how your hair was blowing in the wind. It made the outfit look so much cuter. Gorgeous dress! It is such a great example of beautiful vintage style. I love the way you have styled it - looks fantastic!